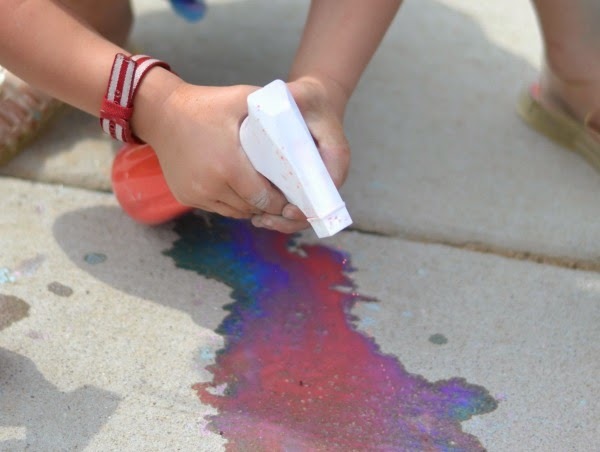 Here is a simple and fun way for your kids to make art this Summer! 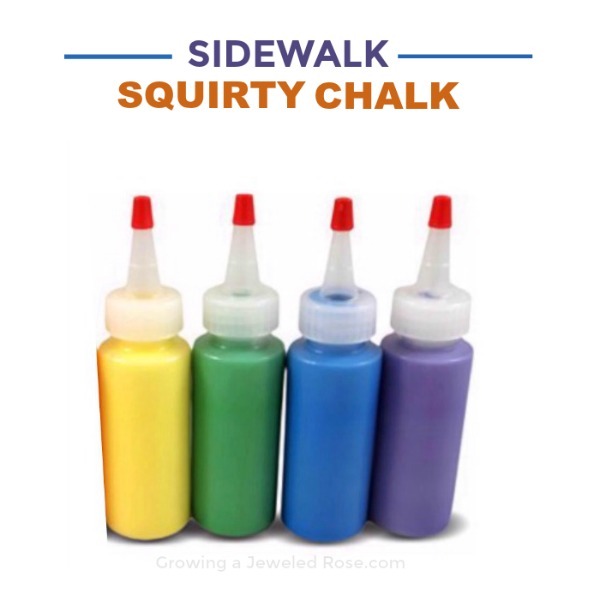 You only need a few common ingredients to make this spray chalk for kids, and it is sure to keep them happy and playing for hours! 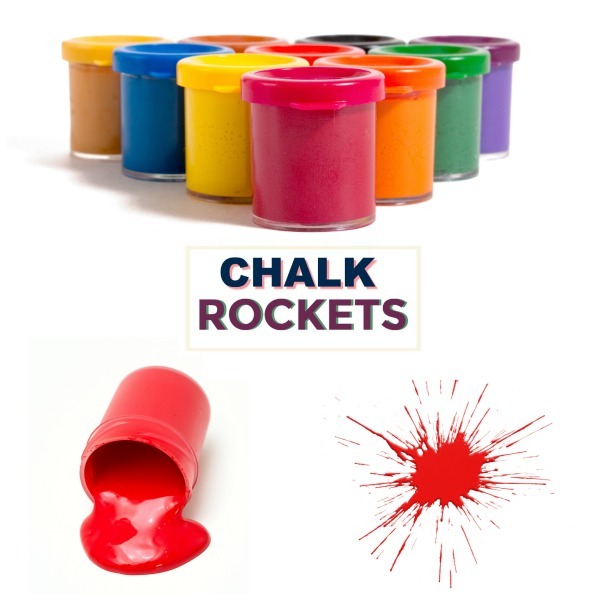 Making the spray chalk is super easy, and the chalk easily washes off of surfaces. 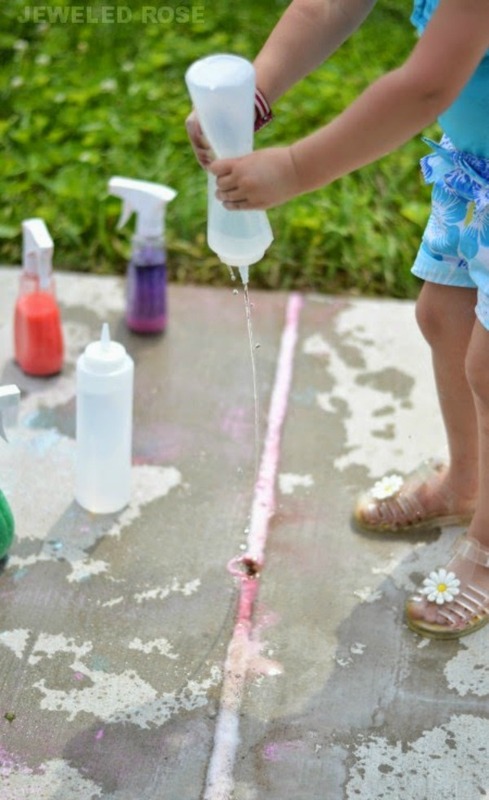 The spray bottles are also great for fine motor development. Are you ready to make your own? 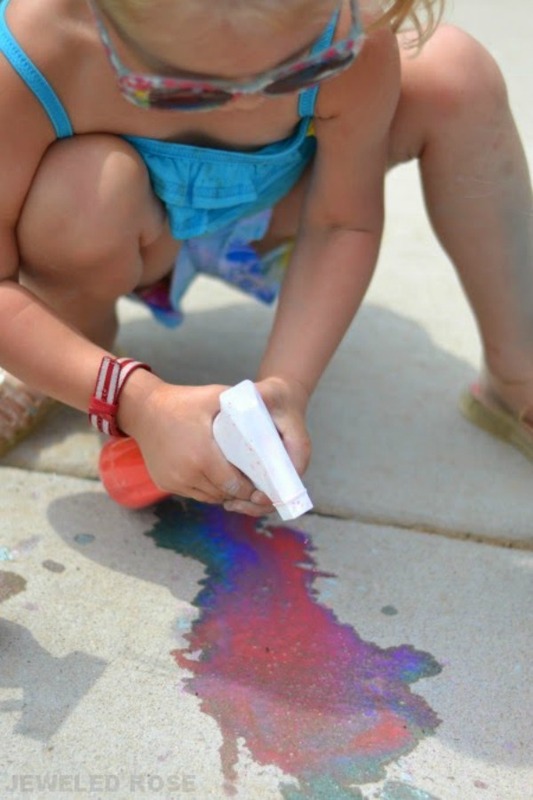 Optional: If you want to make the spray chalk art erupt you will also want a few squirt bottles of vinegar. 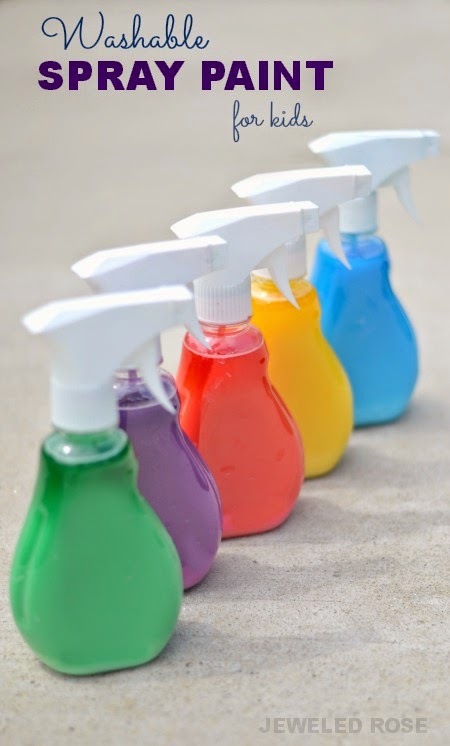 Fill the spray bottles 1/3 of the way with a baking soda and corn starch mixture, using roughly equal amounts of both ingredients. 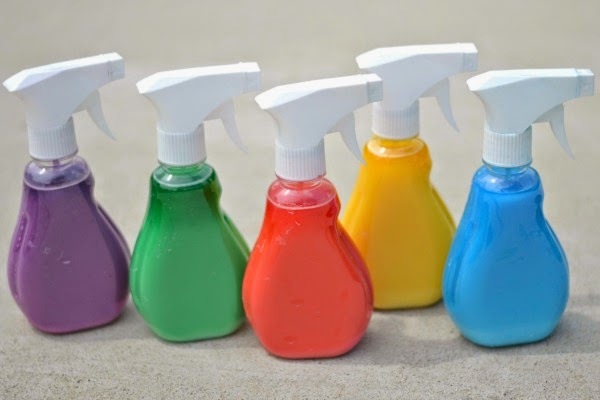 Add a few drops of food coloring or washable watercolors, and then fill the bottles with very warm water, leaving a little space at the top of the bottle. Use a butter knife or similar to stir the mixture as best you can, and then place the spray spouts on and shake the bottles really, really well. 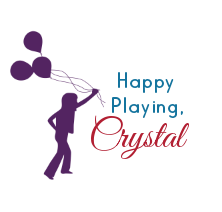 You will want to shake the bottles once more just before play, as some of the corn starch does settle at the bottom of the bottles. Not a bad way to spend a Summer day! 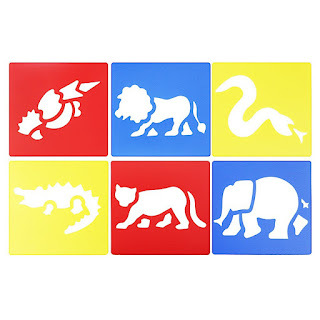 Extend the Fun: Give kids stencils like these so that they can make cool spray art on the pavement. A Few Tips: If your squirt bottle nozzles are clogging that may mean the bottles inner tubing is touching the floor of the squirt bottle. To fix this simply snip a small piece of the tubing off so that it isn't sitting in the residual corn starch and getting clogged. 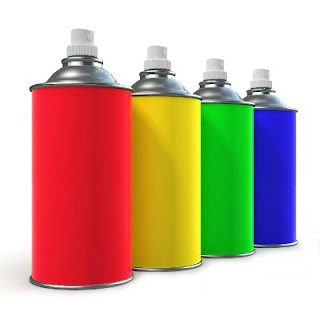 You can get spray bottles online here. The squirt bottles we use can be found online here. 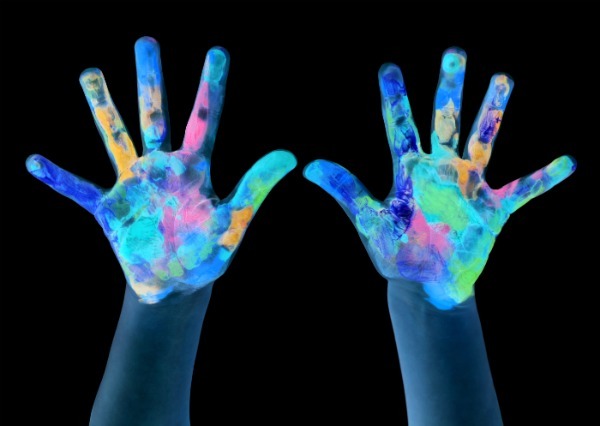 Washable watercolors can be found here.